Wine delivered to your door as often as you want it? In today’s world this is an accessible reality, with several wine subscription services to choose from. Some are tailored to those who are knowledgeable vino drinkers, while others aim to teach the customer about the region and the best types of food to pair with your wine. In the summer, our favorite is Una Lou Rosé’s season pass, which provides monthly deliveries of the pink drink from February to October. But year-round, other options abound: Companies such as Firstleaf, Winc Wine Club, and Bright Cellars let subscribers rate their wine and in turn, match each person with bottles their experts recommend. Wine Awesomeness brings their members stories behind their bottles, paired with a vocabulary lesson (you’ll sound like a pro in no time). Vinebox is for those who want a taste before committing to a full bottle: nine vials are delivered to your door every quarter, along with credit to use towards the bottle you loved the most. There is a company for everyone, no matter what you’re looking for. Below, six more favorites. A wine club that gets better with each box? Sign us up. Firstleaf employs wine experts whose job is to find new and exciting varietals. Customers rate their bottles after consumption, and the company’s system uses these ratings to curate your next box based off of your palate. 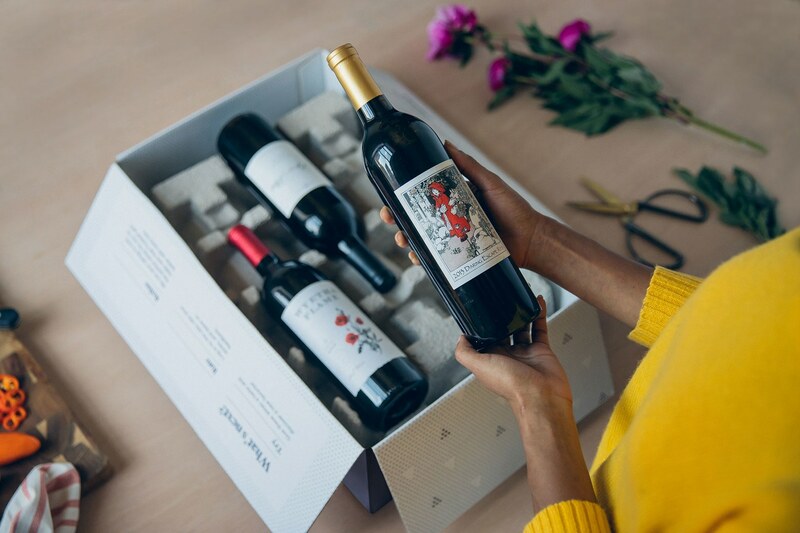 Whether you drink red, white, or both, Firstleaf gives subscribers the freedom to choose what kind and how often they want another shipment of vino. Shop now! This website is basically the matchmaking service of your dreams, pairing you with four fine wines for just $60 a month. The Bright Points algorithm (created by two MIT graduates) scores each wine by comparing 18 attributes to your preferences. If there is a bottle you aren’t particularly fond of, the Wine Concierge will help you select a free replacement bottle. All of the wines are sourced from small vineyards, mostly in Italy, Spain, Portugal, and South America. Shop now! Members of Winc Wine Club receive four wines each month—one for every week! New members answer a six question quiz to help the company assess your tastes. After you try a bottle, you can rate it, which will help Winc narrow down next month’s shipment. This service is extremely flexible, allowing subscribers to skip a month at any time or cancel when they are all wined out. The price per box will vary, as each wine costs a different amount (they start at $13). Shop now! You get more than a bottle of wine with this service. Wine Awesomeness delivers the stories behind the bottles, a wine vocabulary lesson, and the right types of food to pair them with via theblacklabel, the brand’s monthly magazine. Boxes contain three bottles of wine and start at $49. If that isn’t enough, there’s also an option to order six bottles at $79 a box. Members receive their packages monthly, but can personalize the delivery frequency once they become a member. Subscribers can choose between all red, all white, or a mix and shipping is free. Gifting is also easy; just select the duration of the subscription, color of wine, and number of bottles. Shop now! Starting at $72 per quarter, this service lets subscribers taste new wines and discover other regions without committing to a full bottle: Vinebox picks out what they deem to be the 9 best wines of the season, and delivers them in vials, not bottles. Each box of vials (which contains enough liquid for a glass of wine) also includes a credit to purchase full size bottles of any of the ones you really enjoyed. They also offer an advent calendar called Twelve Nights of Wine, a box that delivers 12 glasses of vino from around the world. Last year’s box sold out in four weeks, so if it sparks your fancy, it’s worth pre-ordering. Shop now! Start each quarter off with three new bottles of wine (all sourced from American vineyards) when you subscribe to Nocking Point. The $99 selection is curated by a different individual every time, and also includes a bag of micro-roasted coffee, perfect for the morning after wine night. Wines range from your typical Malbec to a blend of Grenache and Cinsault, but each comes with a hand-designed label. If your three bottles run out and you’re antsy for more, the online store offers additional packs of bottles for purchase. Shop now!